WIN new Dad's Army stamp sets, Isle of Man coins explained, the stamps of the 1960s, plus all the latest auction news! 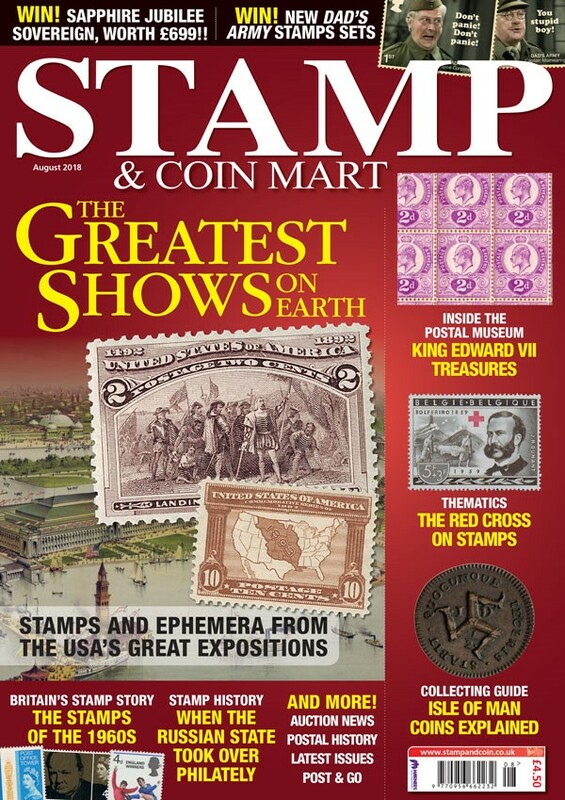 In this packed August issue of Stamp & Coin Mart we celebrate the USA’s great expositions of the 19th and early 20th centuries which lasted for months at a time, and used custom-built pavilions, lakes, bridges and fairground-style rides to create an immersive experience. In the first of a two-part series, David Bailey looks back on these major events and details the stamps and postcards they inspired. - We continue our major series on GB stamps, charting the progression from the 1960s, when pictorial stamps were a novelty, and into the 1980s as ‘special stamps’ became a regular addition to the stamp schedule. - In our exclusive series on philatelic treasures in The Postal Museum, we look at two Edward VII rarities that any GB collector would love to own. - In a special feature from the British Library Philatelic Collections, we tell the story of Victor Whiteley, a leading British stamp designer during the 1960s and 1970s whose stamp designs have been seen across the globe. - Our Stamp Showcase series is a special ephemera edition as we take a look at the ‘Stamped Documents in Hapsburg Empire and Hungary 1686-1858’ which was awarded a Large Gold at Stampex in 2016. Plus lots more, including two fantastic competitions!